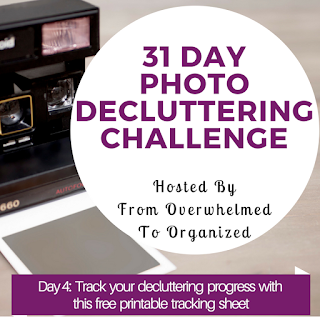 Today I'm sharing two options for tracking your progress in this challenge. There's a free printable tracking sheet as well as a spreadsheet for those who prefer to work digitally. 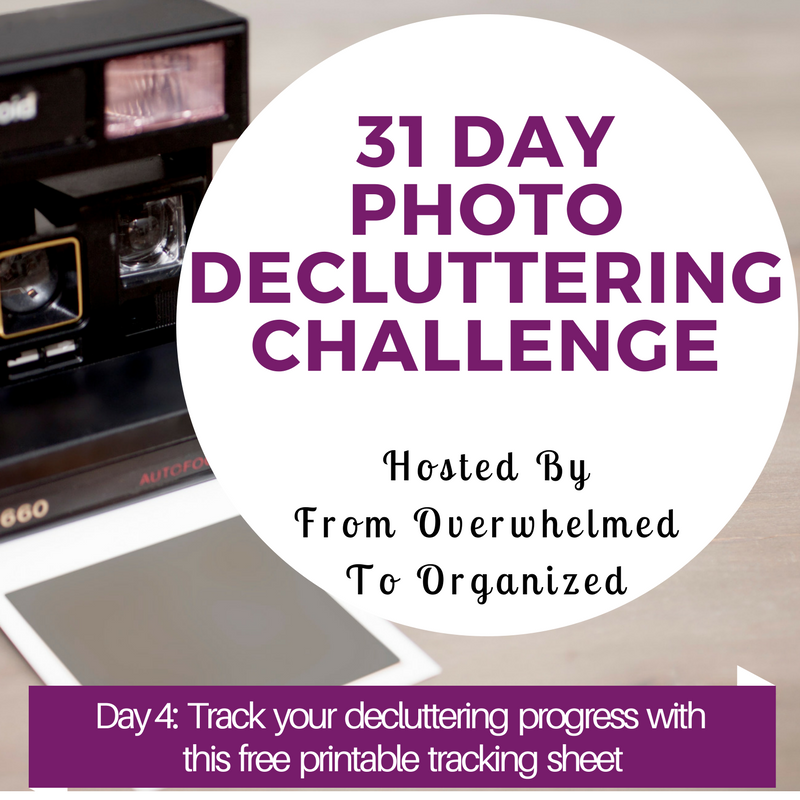 I've been encouraging people in the 365 Items in 365 Days challenge to track their decluttering progress for several years now and it's so great to see people celebrating their progress when they share updates of what they've been decluttering. We can get bogged down with how much we have left to declutter, but this really helps you shift your focus to how far you've come. You can use these documents any way you want. And if you download the spreadsheet, you can modify it to suit your own needs. But basically it's an easy way to jot down your numbers every day. Start by noting your starting numbers of printed or digital photos. Hopefully you made a note of them at the beginning of the challenge. Then every day you can write in how many photos you decluttered in each category. If you haven't kept track of what you've already decluttered, dont' worry... just keep track from this point forward. You'll still see lots of progress! I included a column for printed photos and a column for digital photos because I know some people are doing both this month. If you're only doing one or the other then just ignore the other column. If you don't finish decluttering your photos this month, you can print another copy next month or add more rows to the spreadsheet until you're done. No one is checking these sheets. They are completely just for your own use. But I look forward to hearing about your progress as you use them! 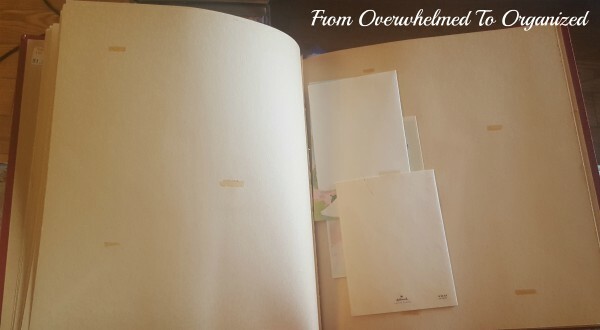 I took a break from decluttering digital photos and starting tackling my old photo albums. 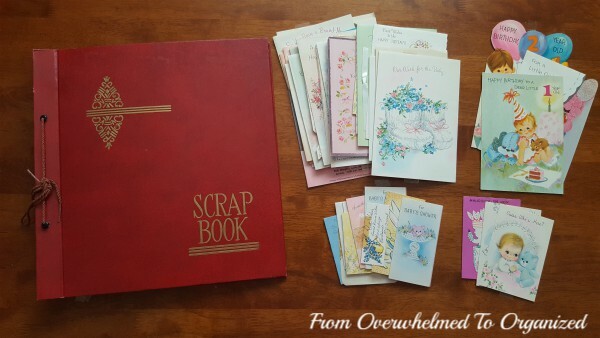 I started with a scrapbook my mom made for me with cards and mementos from the first couple years of my life. 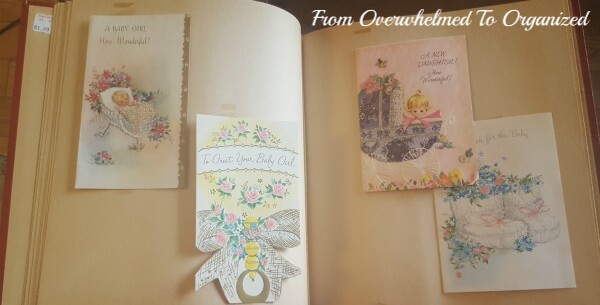 There were cards from a baby shower before I was born, birth announcements, cards from family and friends after I was born, and a few 1st and 2nd birthday cards. It was really cute and fun to look back through these pages. I sorted through all of the cards and deleted 43 of them (almost 1/2). Mostly from people I don't know or don't remember. I may declutter a few more but I want to ask my mom about some of them first. I'm going to add the ones I'm keeping to a memory bin from my early childhood. Today's task is to download whichever version of the tracking sheet you want to use. Fill out as much as you can for the first few days. Keep it someplace easily accessible so you can add to it every day. For decluttering photos, focus on letting go of photos of people you don't know. Ask family members or friends about the unknown people if you can. Hello Hilda, My mom and I are also doing the write31days challenge. That is how I found your site. I love to declutter. Over the summer I downsized my possessions by 2/3. But I still have the decluttering bug so I'm now decluttering and then organizing my computer files. Yesterday I deleted 800 duplicate digital photos. It felt so good to toss them! I'm almost done creating a photo book of a family trip to taiwan. But there is still much to do. I look forward to reading more about your projects. See you tomorrow. Hi Elizabeth! Great job decluttering so many of your possessions and your computer files and digital photos! That declutter bug is strong :) I love that feeling when I declutter! I'll check out your series. Enjoy the rest of the series!